Toronto was founded in a troubled time. It was the summer of 1793 when the first British soldiers showed up to clear the forest and make way for our brand new town. Just ten years earlier, some of those same men had been fighting in the American Revolution. Their commander, John Graves Simcoe, was a hero of that bloody war; no stranger to danger and death. In fact, he seems lucky to have survived the Revolution at all. He was wounded three times — once very seriously. At one point, he was captured and spent six months in an American prison. But by the end of the Revolution, he had earned a reputation as one of the bright and rising stars of the British military. He did so well that when the British created a brand new province in what's now southern Ontario — a home for Loyalists driven out of the United States by the rebels — they chose Simcoe to run it: the first Lieutenant Governor of Upper Canada. The Revolution was over, but there was still plenty of anger on both sides. Another war with the Americans seemed inevitable. Imminent, even. As Lieutenant Governor, Simcoe spent much of his time preparing for it. One of the first things he did was to move the capital of Upper Canada (originally at Niagara) away from the American border where it was vulnerable to attack. He sent a hundred of his men to a spot in the woods on the northern shore of Lake Ontario — a place called Toronto — to build a new capital: York. It had a natural harbour which would be easy to defend. And the very first thing his men did when they got here was to start building a military base: Fort York. Soon, they'd carve new highways through the ancient forests — roads like Dundas and Yonge — so that Simcoe's army would be able to move quickly through the province in response to any American invasion. About a week after those first soldiers arrived in Toronto that July, Simcoe joined them in person. He brought his family with him: his wife Elizabeth, some of their children, a house cat and a pair of pet dogs. At first, they lived in a fancy tent on the beach at the mouth of Garrison Creek, near where the soldiers were building Fort York. While Simcoe set to work planning his new capital, Elizabeth was charged with the task of bringing aristocratic British culture to this remote outpost tucked between the primordial Canadian forest and the vast waters of Lake Ontario. As the fledgling town began to take shape and the families of other government officials arrived, Elizabeth Simcoe was at the centre of social life in the new settlement. She paid visits to the other families, entertained, held dances and dos. Meanwhile, she painted watercolours and kept a detailed diary, providing an invaluable historical record of Toronto's earliest days. But it was also a worrying time. The Simcoes were among King George's highest ranking representatives on the entire continent — living in a tent on the very edge of the Empire just across the lake from a powerful new nation that loathed the monarchy and might declare war at any time. The sails of American warships could appear above the horizon at any moment, without warning, there to seize the new capital — and the Simcoes with it. And it wasn't just the Americans. The Revolution in the United States had inspired an even bloodier uprising in France. The French Revolution was in full swing during the summer Toronto was founded. The Reign of Terror began that same fall. While the Simcoes were bringing aristocracy to their tent on the beach in Toronto, aristocrats in Paris were losing their heads to the guillotine. A few months earlier, the new French Republic had officially declared war on the British Empire. During their time in Toronto, the Simcoes received a slow trickle of news from France. In August, they were visited by a pair of French aristocrats who hoped to settle in Upper Canada. The men told a morbid anecdote about King Louis XVI's famously botched attempt to escape his captors. In fact, just a few months before the Simcoes arrived in Toronto, the French king had been executed. A few months after they arrived, Marie Antoinette followed her husband to the guillotine. The news of her death took several months to travel across the Atlantic and up the St. Lawrence to Toronto. It was on the first day of March in 1794 that the first lady of Upper Canada learned of the fate of the first lady of France. Elizabeth Simcoe recorded the event in her diary: "The News received of the death of the Queen of France." Despite the British war with the French, the rulers of Upper Canada marked the occasion with solemn respect. "Orders given out for Mourning in which everybody appeared this Evening & the dance was postponed." 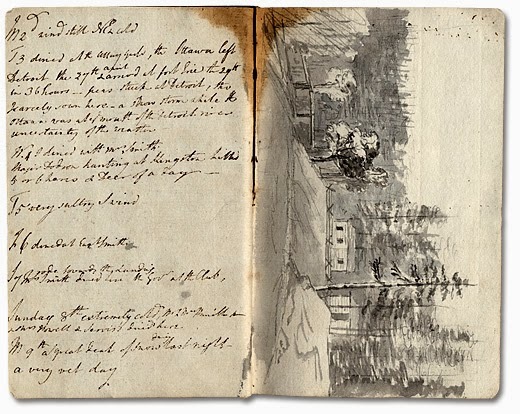 Just four days later, Elizabeth Simcoe wrote another diary entry about her growing fears. "There have been apprehensions that the french Republicans at New York would attack Lower Canada [Québec] from Albany this winter, but a mutiny on board some of their Ships carried them to France. If the Americans were to attack this Province I should go to Quebec [City]." "I dreamt some time since that the Gov. [Simcoe], Mr. Talbot [Simcoe's personal secretary] & I were passing a wood, possessed by an Enemy who fired ball at us as fast as possible. I was so frightened, that I have never since liked to hear a musquet fired & I am quite nervous when I hear of the probability of this Country being attacked." It's just a brief mention, and it's unclear on exactly which night she had the dream, but those few lines give a remarkable insight into the emotional life of our city's earliest days. It's a reminder that Toronto didn't start out as a completely safe haven. It was born at a time of war and upheaval on a dangerous frontier thousands of kilometers away from the heart of the British Empire. It was a beautiful and serene place, but for those first few inexperienced settlers, it was also remote and frightening. The fear was so strong that it haunted even the dreams of the most powerful woman in the province. The Simcoes only spent two more years in Canada before the Lieutenant Governor fell ill and the family was forced to return home to England. But the spectre of war continued to haunt them for the rest of their trip. The situation with the Americans was deteriorating. Simcoe was convinced that war was about to break out; he was already hard at work trying to secure First Nations allies. That winter, the Simcoes decided it was too dangerous for the family to remain at York. The Lieutenant Governor headed to a British military fort on the border at Detroit, while Elizabeth Simcoe took the children to the relative safety of Québec City. A peace treaty did finally manage to avert an immediate war with the Americans, but the British were still at war with the French. It was in 1796 that the Simcoes finally sailed down the St. Lawrence toward the ocean and home. But when they reached the mouth of the St. Lawrence, French warships were waiting for them. They were chased out into the Atlantic. The French seized some other English vessels sailing nearby. Guns were heard in the distance as they dodged icebergs off the coast of Labrador. Elizabeth Simcoe and the children hid themselves in the cramped quarters below deck. They were stuck there for days on end. She wrote in her diary that she was "in perfect misery every moment expecting to hear the Guns fire, as I had no Idea what it was to be so frightened. Some refreshment was sent me but I could not eat... I played at Backgammon & Cards which tranquilizes my mind but it will be a great while before I recover my fight." It took weeks to sail across the open ocean before the Simcoes finally reached the safety of home. Elizabeth Simcoe never did get fired upon from the cover of a Canadian forest. But her nightmare did prove to be at least a bit prophetic. Twenty years after the Simcoes founded Toronto, the Americans did invade Upper Canada. The capital was attacked and occupied by American soldiers during the War of 1812. They looted homes and burned public buildings, including the very same Parliament Buildings commissioned by John Graves Simcoe. Muskets were fired from the cover of the forest. Many other women and their families had to face the same terror that had disturbed Elizabeth Simcoe's sleep all those years before. Today, two hundred years later, Toronto is one of the most peaceful cities in the world — a place for people to escape those kinds of nightmares — but in our early days, the fear of invasion must have inspired countless bad dreams. A version of this post originally appeared on The Toronto Dreams Project Historical Ephemera Blog. You can find more sources and other information there.